We just got home from Connecticut late last night. It was a sad occasion to have to go up there for a memorial service for my husband's grandfather, but it was nice to see the family. I'm very family-oriented, so I just kind of relish the idea of having all of that family around. This was a very quick trip as we drove up Friday and then back on Sunday. It's definitely not one of those places that you make a quick trip, unless you have to. Boy, it is a long car ride!! It's good to be back and getting into the swing of things! 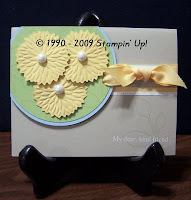 Here's the first card from this month's 'N2 Stampin' workshop. Simple, simple! We used the Big Shot and the new Flower Burst Embosslit. I love these! What's better than a die that not only embosses but cuts out the image!!! We also used the Chit Chat Rub-ons for the sentiment. The Bashful Blue and Certainly Celery circles were cut out using the Circle Scissor Plus and Glass Mat. Fold the Sahara Sand cardstock in half and stamp the leaves from the Central Park stamp set on the bottom right and on the Certainly Celery circle using Certainly Celery ink. Mount the strip of Delicate Dots DSP on top of the Sahara Sand card. Delicate Dots DSP is a Sale-a-Bration item, FREE with a $50 merchandise purchase. Next layer the Certainly Celery circle on top of the Bashful Blue circle. Use the Horizontal Slot Punch to punch a hole for the ribbon to go through. Tie the So Saffron 5/8" Grosgrain Ribbon (another Sale-a-Bration item) around the card on top of the DSP coming up through the slot in the circles. Adhere the circles to the card using Dimensionals and trim the circles on the edge of the card. Cut out three So Saffron Flower Bursts using the Big Shot and the Flower Burst Embosslit. Adhere a half pearl to the center of each flower using the Mini Glue Dots and mount flowers to the card on top of the Certainly Celery circleusing Dimensionals. Finally choose a sentiment from the Chit Chat Rub-Ons and there you have your very simple, yet elegant card. Experiment with different colors, flowers and layouts. I bet that you'll have a blast!! Until next time... happy stamping! !